Verdict: Excellent about this keyboard is great, except the mushy keys. If Lenovo was use a higher quality key mechanisms or even an mechanical keyboard, then this keyboard would be unbeatable. Also, i wished Lenovo actually included the palmrest with these keyboards, as it would make the typing experience much much better. 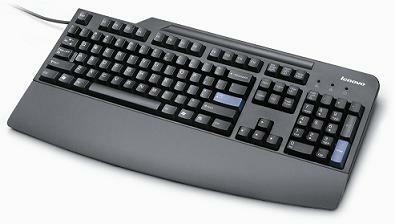 However, on a side note this keyboard is one of the best typing keyboard shipped by the large brand computer companies (the Apple wired keyboard is no longer shipped standard) when compared to those keyboards shipped with Dell, HP, Acer, etc). Picture 1. 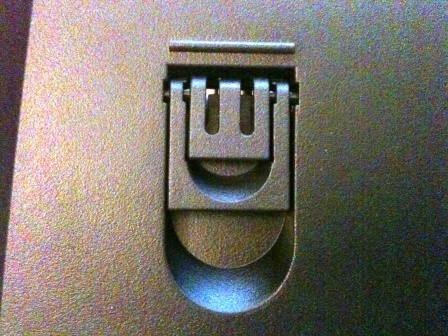 The Lenovo Preferred USB keyboard from IBM/Lenovo website . I have had several generations of this keyboard as far back as the IBM Netvista days (it had a slightly different design back then), which was almost 12 years ago. Much of the design of this keyboard has remained the same, which is a good thing as there is not much that needs to be changed on this keyboard in terms of overall design or form factors. Picture 2. 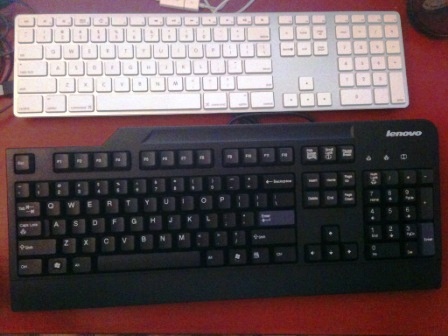 Lenovo Preferred usb keyboard comparing to the Apple wired keyboard. 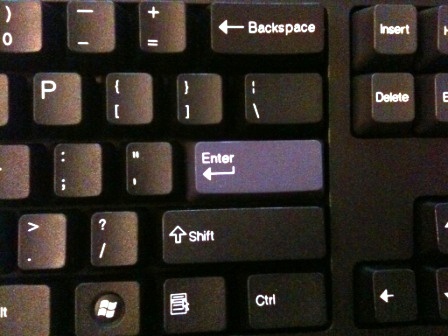 This keyboard is fairly basic in terms of feature and design, as such there are no dedicated media keys, which is fairly common in most keyboards nowadays. For those whom may like to have dedicated media controller keys, there is a version called the Lenovo Enhanced Performance USB keyboard (Reviewed in my other post), which have the media control keys and a set of dedicated shortcut keys. Picture 3. 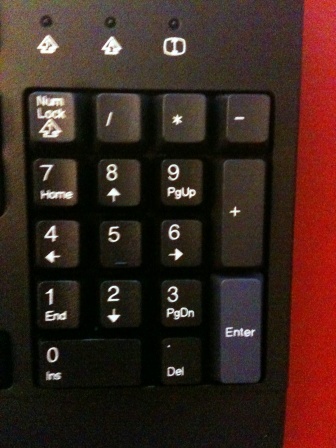 Pictures showing the coloured Enter key on the Lenovo keyboard. The keyboard is fairly easy to recognise due to the all black chassis colour and blue enter keys, also if you are still unsure there is always that large silver Lenovo brand logo to remind you. Picture 4. 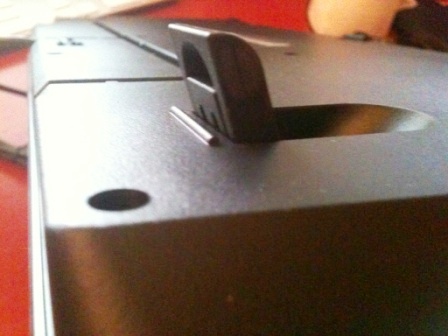 The trough on the top edge of the keyboard for holding pens/pencils. The quality of construction of this keyboard is second to none when compared to other standard keyboards that is bundled with brand name desktops (i.e. Acer, Dell, HP, Acer, etc). The fit and finish of this keyboard can put many more expensive keyboards to shame. The only real problem with this keyboard is the mushy feel of the keys and the lack of bundled palmrest. If Lenovo could put acquire Unicomp and use their buckling spring technology in this keyboard, then it would be the ultimate keyboard package that would run circles around other mechanical keyboards. Picture 5. 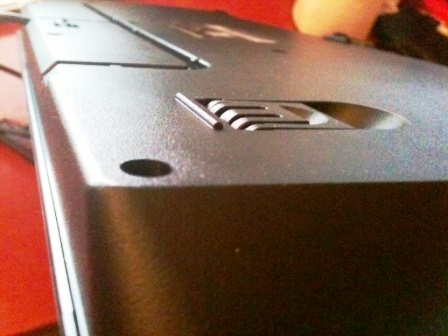 The backside of the Lenovo USB Preferred keyboard. There are some really nice design touches to this keyboard that i should mention. 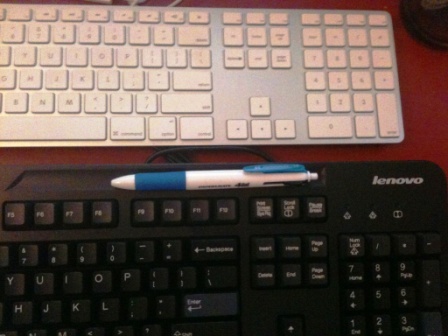 One is the pen trough on top of the keyboard (shown in picture 4), which is something quite useful in the office environment that other keyboard manufacturer forgets to add (maybe Lenovo still holds the patent to it). Another nice design touches is the fact that this keyboard have a two heights kickstand (picture 8 to 11), allowing typists to better adjust their keyboard for the most comfortable typing position. There is also two liquid drainage holes on the keyboard, just in case you decide to spill your coffee or water on it (i have already tried this feature about 1 year ago, when my cat pushed over a can of soft drink on the other Lenovo keyboard that i had). For some reason Lenovo doesn’t include the rubberised palmrest with this keyboard, even though it appears in the online advertisments. Picture 6. 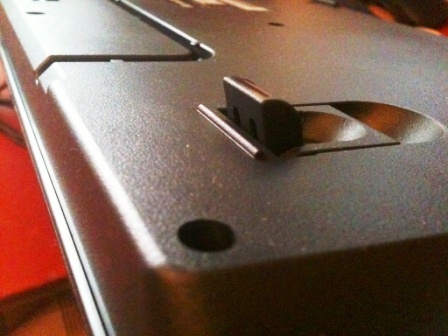 The notch for inserting the palmrest (next to the rubber feet), also shows the drainage hole. Picture 7. 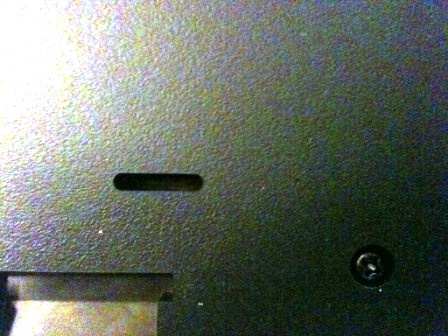 The drainage hole (there are two of them on the keyboard) of the keyboard. Picture 8. The kickstand on the keyboard. Picture 9. The kick stand in full height mode. Picture 10. The kickstand in half height mode. Picture 11. 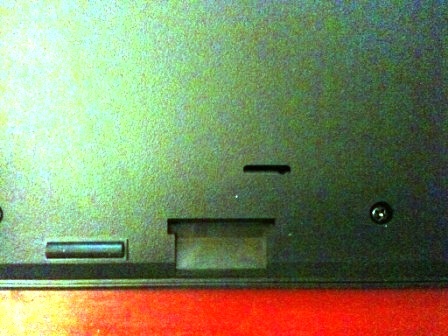 The kickstand when fully retracted. A nice keyboard that has a potential to be an uber excellent keyboard, if only the key feel is better. 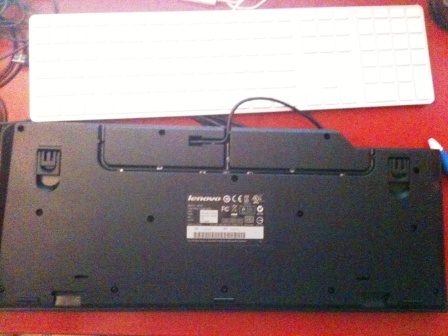 Basically Lenovo needs to acquire Unicomp and put the buckling spring key mechanism into this baby.